Zulfah Otto Sallies, filmmaker, writer, playwright, reflects on the cultural and artistic influences of Bo-Kaap, the South African Cape Town community where she grew up, lives and works. Zulfah, you are a filmmaker, writer and playwright—among other talents! Please talk a bit about yourself. I grew up in a society that was culturally very strong. The Cape Malay identity was engrained into our psyche it gave us a sense of belonging and assurance that our culture was an important one. It was a case of having a thousand mothers. Where every mother in the neighbourhood could reprimand you, check that you tow the line. Neighbours played an important role in our upbringing. Every home in the neighborhood was one that you could frequent as your own. A place to hide when your parents were angry with you, a place where lending a cup of sugar, a tomato was a common phenomenon. Religion is the backbone of the culture and forms the basis of the moral values of the Malay culture. The Cape Malay culture for me meant very much there is a time and place for everything. New Years Eve meant standing in Wale Street watching the Malay choirs parade. 2nd New Year saw the Cape Minstrels parade. These cultural events shaped the Bo-Kaap, that still boast as one of the safest areas in Cape Town. I started to read the works of Rumi as a teenager and could then not understand much. These works inspired me so much that I resorted to writing poetry at a very young age. Mystical poets began to shape my love for literature. I would later venture into various art forms, writing of novels, short stories, film scripts, plays and later resort to making my own films. It is my passion for Bo-Kaap, a place where I still reside that makes waking up in the morning pure bliss when you have the privilege of waking up to Table Mountains greetings of the day. Your work shows the multicultural character of South Africa, especially the complexity of Malay and Muslim identities in Bo-Kaap. What is the background and history of this community? The Bo-Kaap is one of the oldest communities in South Africa. It is the first established communities where free slaves settled in. Particularly the slaves from Java, Sumatra, etc. The Muslim identity is the first basis that is formed and laid as a foundation for the children of Bo-Kaap. The manner in which religion was taught to us as kids was not in Arabic but very much in Afrikaans. Afrikaans was written in Arabic letters. This difference in religious teaching saw the growth of Afrikaans as a medium of communication for the Bo-Kaap people. When apartheid was at its height Bo-Kaap resorted to a boycott of the Afrikaans language that led to most kids in Bo-Kaap today speaking English. I am of the belief that language and culture are strongly connected hence with the loss of Afrikaans we have lost a lot of our culture. In the case of the Afrikaans language it should be noted that the people of Bo-Kaap have their own rhythm and dialect of Afrikaans that they speak. The mosques on a Friday would give their sermon solely in Afrikaans, today that is not to be found. So it is this freedom of a time and place for everything that makes being multicultural an old hat that Bo-Kaap residents has worn for over 300 years. The tolerance of each one to its own, and the respect that comes between. Your first short film, Raya (2000), which is part of the Mama Africa series, is multi-layered, dealing with issues of generational differences, traditional versus contemporary views among Muslims, and the lure of drugs and its consequences. We also see the world of the tight-knit community of the Bo-Kaap. How was the story conceived and why did you want to tell it in this way? Raya to me was about three generations that have to cope with the ever-changing society they live in. The society of Bo-Kaap that is rapidly changing. The world of Raya that is so different to that of her mother’s where the evils of society like drugs is available on almost every street corner. The world of Raya also speaks about cultural resentment and expectations of society where being a tight-knit society that can also be the noose that chokes you, as everybody knows everybody’s business. Raya is a story I wanted to tell this way to also portray the relationship between mother and daughter and also showcase its complexities within a society of Bo-Kaap that is culturally strong. In your documentary film, Through the Eyes of My Daughter (2004) you discover your own daughter and aspects of yourself during the filmmaking process. Of course, now eight years later, Muneera is a young woman. What was that process like? Perhaps talking about it in retrospect and relaying it to the present. Through the Eyes of My Daughter was a phenomenal experience. It turned the lights onto my daughter and me, and zoomed into our world for one year. My daughter at the time was 15; today she is 23 and always threatens to turn the camera on me now. She herself completed her degree in filmmaking at AFDA and is in the process of producing my next feature “Diekie Vannie Bo-Kaap”. Through the Eyes of My Daughter gave us the foundation to work together and that to me as a mother is a great honour as today we still are able to work together. Sometimes it is really hard and complex but both of us know the professionalism required to deliver a quality product and hence we are able to put emotions aside, get our hands dirty and do the job. Your feature film Don’t Touch continues your focus on family, generational differences, and Muslim identities and the youth of South Africa. Why did you want to explore these themes? The theme of generational difference is a strong interest of mine as with every generation we lose more and more of who we are. What society perceives as technological advancement is also the regression of moral and cultural values with each generation thinking they are more advanced than the older generation. Perhaps we can simplify this with an example of the current generation that is magnificent with technology but unable to read, let alone spell properly. So the older generation may not have been the best of readers but they were effective and useful citizens that were in the service of humanity. I have strong views on today’s society that is technologically savvy but so individualistic that they become almost useless citizens of a society. They serve only their own needs and not that of the greater society. It is here that I feel culture plays a big role that keeps one as a contributor to society, that builds the character of individuals. Don’t Touch looks at the modern teenager in Bo-Kaap that is confronted with living in the new South Africa with many cultural diversities and exposures. This is played off against the cultural background of Bo-Kaap. The daughter as rebel, confronting traditional values in her contemporary world, has been the point of departure of your films. Where do you situate yourself within this? I am very aware of tradition vs. the contemporary world. I believe that some things we have to retain from tradition, as it shapes our identity and forms our basis of being. In the contemporary world we shape who we want to be, whether we stay clear from culture or not, we have a basis to fall back on if we so desire. The teenager all over the world is a rebel, confrontational and fighting to be heard and seen. Added to that, the religious basis confronts this rebellion and questions moral character. Teenagers will always question, confront and rebel and this we should perceive as a big part of growing up and have the room to let them express themselves. In Through the Eyes of My Daughter, sports, i.e touch rugby, was a means of expression for my daughter, hence the teen years were not so bottled up, but still it was confrontational and difficult. Your current film project is Diekie Vannie Bo-Kaap. Please tell us about it—from the theatre production, to the book and now to film—where you are in the production process and plans for the film. Diekie Vannie Bo-Kaap is a very successful teen book in schools. It is used as a high school set workbook and is very popular. Currently we are at the fundraising stage of this project with the script and all other paperwork in order. We hope to shoot next year around September 2012 if we manage to secure funding. This will be the first film that I do with my daughter as my producer so I am really looking forward to it. 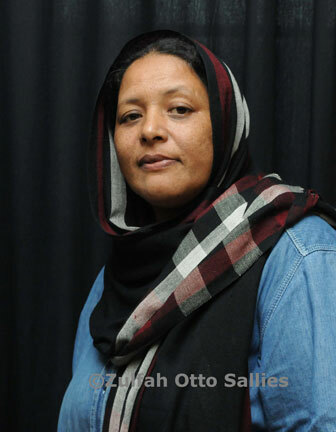 Interview with Zulfah Otto Sallies by Beti Ellerson, October 2011.